PETA wants to spread its stance against animal cruelty every where – and we do mean every where. 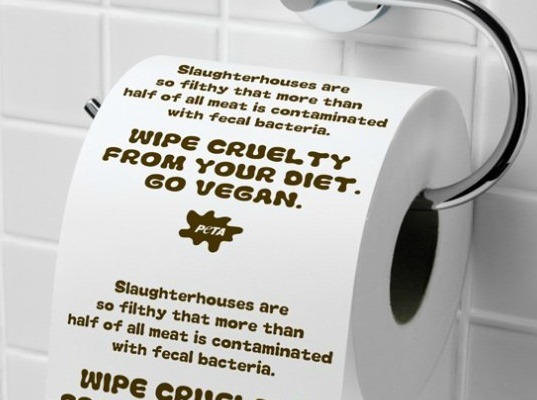 Toilet paper with an anti-meat message is yet another way that the animal rights organization is teaching consumers about slaughterhouse conditions. Now those uncomfortable family gatherings where certain topics are swept under the rug can be relegated to a new form of bathroom reading material. Why would anyone want to buy toilet paper at $5 a roll with a confrontational political message? Well, PETA’s marketing pitch certainly does not hold back. The organization is quick to remind us that not only slaughterhouses, but fishing boats, are filthy from feces, blood and yes, vomit, which means that meat is often contaminated with dangerous intestinal bacteria. Whether or not PETA’s graphic testimonials result in shoppers stocking up on more than one roll at a time has not been disclosed. PETA has unrolled its toilet paper before to make political statements against meat consumption. Three years ago the organization offered to ship supplies of its toilet paper, with a message in Spanish, to Cuba when it was revealed that the country was close to running out of its stock. The paper product bailout offer extended to New Jersey, too. A contract standoff in Trenton that threatened to wipe out the city’s bathroom supplies ended with PETA contributing a six month stock of toilet paper on the condition that its pro-vegan message was unfurled in city government bathrooms. For PETA, the 16 billion animals that are killed for food every year in the U.S., not to mention the impact that meat consumption has on workers and the environment, are all worth a reminder to vegans and non-vegans alike. And so PETA’s message continues to reverberate, one sheet at a time. PETA wants to spread its stance against animal cruelty every where - and we do mean every where. 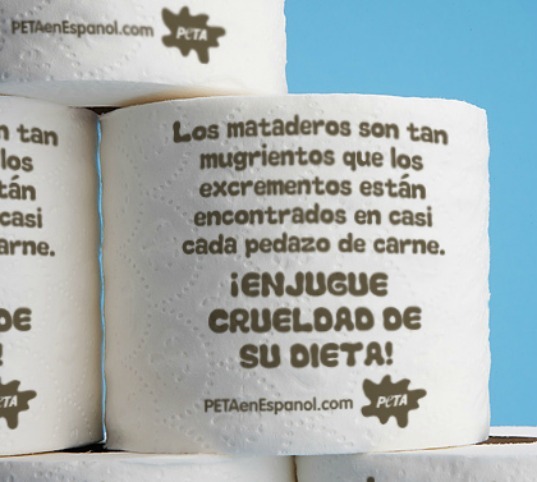 Toilet paper with an anti-meat message is yet another way that the animal rights organization is teaching consumers about slaughterhouse conditions. Now those uncomfortable family gatherings where certain topics are swept under the rug can be relegated to a new form of bathroom reading material.